Twice a month am introducing newbie bloggers to this immense blogging virtual world, just to showcase their blogs with their guest posts they prepred specially for me and i named the event as Rendez vous with a foodie. Many new fellow bloggers came towards me to join this event and shared their fabulous dishes since ever i started this event. Happy that this event is going successfully since a year. I came to know more about my guest hosts through their replies they shared for my questions along with their guestposts. Each and every posts of my guest hosts are unique in their own way. Today's guest is an another wonderful sister i have met recently through Facebook, she was very kind and very humble and very sweet too. We are good friends since ever we started chatting and its really wonderful to know this busy working mom of two kids.I wonder always how working woman, busy mom feed their blog quite often. One among those active blogger aka mummy aka working woman is Sujatha Ram of Indian Veg Kitchen, my today's guest. Seriously i'll appreciate her for being active in this bloggy world often eventhough she is tighted up with many commitments. I have many favourites at Suja's space, love her bright and stepwise pictures. Everytime i bloghop her space, she never forget to make me drool. Have you ever heard about Karama Upma, a Tirunelveli special Upma prepared with rice flour, Suja shared this completely unknown dish with us. Trust me, if you go through her space, you will definitely spend your time in a wonderful way, please dont forget to keep aside few paper towel coz you wont stop drooling there. Lets hear from Sujatha Ram..
Firstly, I would like to express my heartfelt Thank you to Priya akka for giving me this wonderful opportunity of being her guest for today. She is one of the most awesome friend whom I have got through this lovely world of Food blogging. Though I have been blogging for a few months now, I was little hesitant and shy to reach out to make new friends. Also, with a severe time-crunch, I could’nt actively involve in commenting on my fellow blogger friends’ posts, which I really love to. Because of that, when I come across lovely friendship bonds or a Bloggers meet, I felt bad that those are out of my reach. But, in our first FB chat itself, Priya akka made me feel so comfortable and close and Iam lost for words to tell you how happy and out-of-the-world I felt after chatting with her. Only because of her warmth and friendliness, I became confident and started to slowly involve in events and discussion forums. Thank you dear for opening up this lovely world to me. Coming to her blog, I was stunned when I saw her recipe index pages. What a great array of recipes! Be it Traditional, Eggless, Vegan, International cuisines, Bakes – You have it all at her space. It shows her real passion for blogging and her hard-work behind every recipe which is very inspiring to every budding blogger. I can’t stop looking at her with awe at the way she efficiently manages two blogs and regularly updating both with rich contents. Hats off to you Priya akka! My personal favourites are her Mango Cheesecake,Pumpkin-oats-nutella muffin, Apricot pannacota, all her healthy eggless bakes, bread varieties and fusion recipes. The bookmarked list is so long and Iam waiting to try one by one in the days to come. 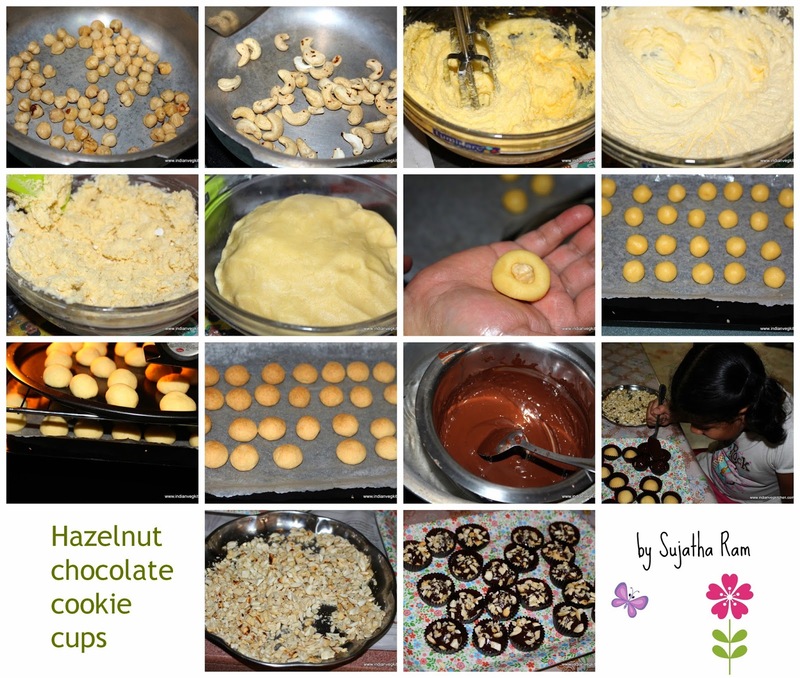 Dear Priya akka, Iam virtually sending you this cute Hazelnut-Choco Cookie Cups to celebrate your kindness. Hugs. 1)Tell us about your blog and you? Hi, Iam Suja Ram, a working mom of two lovely girls and I share my passion for cooking and baking at Indian Veg Kitchen. Food has always been a buzz to me and I love to try both traditional Indian delicacies and also venture into International vegetarian and vegan recipes. Off late, I find myself being so much addicted to get a hold of the art of Eggless Baking. All these are sure enough to lead me into this beautiful world of Food blogging with my DH’s support and encouragement. 2)Before and after blogging, tell us what blogging changed your life? Though Iam fighting against time to juggle things, blogging gives me immense happiness and a sense of contentment pops up after every successful recipe post. Putting together a proper meal requires thoughtfulness and organization, which applies to blogging as well. I used be very poor in planning, but now Iam trying to get more organized. As a health freak, I always try to avoid processed food and the use of artificial/ synthetic flavours or colours. After I started blogging, looking into details and picking healthy ingredients have become a Mantra to me. Though I do cook occasional treats which are high in calories, I make sure to avoid store-bought readymade ingredients wherever possible and make from scratch instead. In an attempt to deepen my knowledge and write better, I read more than I used to before. My DH is the one behind everything I do. He was the one who strongly encouraged me to start a blog and share my passion. My mom was an awesome chef and she used to amaze everyone with her cooking skills. She whips up even the most trickiest stuff effortlessly. Iam sure, whatever Iam today is that I’ve taken after her. Unfortunately, she left us when I was 15. I thought this blog would be a humble tribute to such a dynamic woman in my life, full of knowledge,energy and enthusiasm.Love you ma! 4)There are a tons of blogs/pages on food these days, what accordingto you is the speciality of your blog and the food you cook? Yes, there are so many lovely blogs out there, of which many are my favourites. Coming back to my blog, I try and test atleast a couple of times before I blog about any recipe. A recipe will be up on my blog only after it is appoved by my DH and kids who are the best critics I have got. Also, I have stepwise illustration which everyone will find useful when trying a recipe. I would share all possible tips and include a troubleshoot section wherever applicable and make sure that one who tries my recipe does’nt need to look for any other source for clarification. 5) When it comes to cooking, who is your inspiration? As I shared earlier, my mom was such a great source of inspiration. She was so passionate about cooking and re-creates any exotic Restaurant-style recipes at home. I have those fond memories of her which drives me from within. But, in her place, God has gifted me my mom-in-law now who is a wonderful cook as well. I learnt the basics and many useful tips and techniques from her only. Both my MIL and FIL compliment even a simple food I make and that encouragement has inspired me to try out more complex dishes. As with giving a healthy tweak to any conventional recipe or developing new recipes, most ideas are from my DH. 6)Every newbie blogger faces tons of challenges when its comes to blogging, tell me about one of the challenges you faced and how did you overcome it?Please specify with the facts. Oh, those technical stuff really scared me. Lucky, my DH was there as a saviour. Also, I must thank my blogger friend Jeyashri (of Jeyashri's Kitchen) for guiding me with through my first post with every little detail and step. She has been my great support. Whenever I encounter a difficulty, she was there for me to look upto. Of course, we can always resort to Google which has answers to most troubles we encounter technically. My first post Mysore Pak still holds the first place among favourites. But, Raspberry Cheescake, Blueberry Boy Bait,Chocolate Chip Cookies, Pizza, Paneer Butter Masala,Oats Tikki, MIL’s special Thengai Paal Kuzhambu…Oh my list is too long..let me stop here. 1. Natural lighting is a boon for great pics. 2. Do not use flash photography. 3. Little styling and composition does wonders. Avoid too much clutter. 4. As with any art, patience and the spirit to learn is important. 9)What is your budget for the props,do you have any or else do you manage with your household stuffs? When I started blogging, I did’nt have fancy serving bowls or cutlery. So, I had to buy some to take decent photos. My budget is $2-3 for each stuff. But, if we find anything really exclusive ,then, we don’t mind spending a bit more. When I started,I thought I should post atleast 3-4 per week. But, practically, Iam struggling to post atleast 2-3. But, with my involvement in events like Blogging Marathon,I hope to keep up the pace and become regular in posting. Here, I would like to express my gratitude to all blogger friends holding such events, especially Srivalli, Priya akka and many others. Those are giving big doses of inspiration for me. 11)Do you have any other passions apart from food blogging or blogs you own? Music and reading books are my hobbies. Now, learning photography has also been added to this list. This Hazelnut Chocolate Cookie Cup recipe is very special to me. This recipe was shared by my Singaporean friend and it was my first venture in baking. These buttery cookies topped with chocolate and crunchy bits of nuts truly taste exotic and it earned me compliments from family and friends whenever I did them. In turn, it inspired me to buy an oven (I did my first batch at my SIL's place) and try out a variety of eggless bakes. The cookies are mildly sweet as they are combined with chocolate and ideal for parties. Lets get started! 1. Dry roast the nuts separately, each for about 2-3mins until it emits a nice aroma. Finely chop the cashews and set aside. 2. In a bowl, cream butter and sugar for 3-4mins until smooth. 3. Add flour and knead it into a soft dough. Use the milk to get the right consistency. 4. Make small balls,flatten it, pop in a whole Hazelnut and roll into a ball. 5. Bake in a pre-heated oven at 180C/350F for 20-25mins until the bottom is browned slightly and a toothpick inserted in the centre comes out clean. 6. Meanwhile, using a double-boiler, melt cooking chocolate without any lumps. This takes about 4-6mins. Make sure not even a single drop of water gets into the chocolate mixture. 7. Allow the Hazelnut cookies to cool. Place them in cute cupcake liners, and pour chocolate generously. Top them with cashew bits. Once cooled, the chocolate sets so well on top. How cute na..Such a cutie pie she is..Adorable helping hands..Suja you are so lucky to have those helping hands. Hope you all enjoyed going through this guest post, stay tuned for an another guest post very soon. These cookie cups are so delicious! Thanks for sharing, Suja Ram. Nice guest post,looks so cute and delicious. Nice guest post n happy to knw abt our co blogger Sujatharam.....n The cookies cups r just tempting.. Thank you Priya akka for this opportunity. Great effort akka as usual! !